Scrapping Out of Control: BIG NEWS!! My name is Nancy Morin. I'm 32 years old, married to my best friend, and we have three wonderful kids. Two girls ages 13 and 5 and one boy who is almost two. I began scrapbooking about three years ago. Shortly after, my interest in scrapbooking lead me to the YouTube community where I discovered how fun and exciting this industry had become. This route lead me to Emma's channel (aguilarsplace) on YouTube and since then, I've been hooked. My intentions are to preserve my children's memories so one day they too, can share these memories with their families. I have been blessed with a supportive husband who has given me my scrappy haven and has custom built my scrappy table. I'm a very lucky girl! I don't have a specific style as I love it all. I incorporate my machines like the Cricut, Imagine, and my gypsy. I'm inspired by mix media arts and crafts, but prefer a simple and clean style. 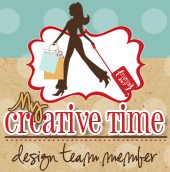 I am very excited to be part of the My Creative Time Design Team and cannot wait to get started! For my project, I created this simple yet elegant layout of my family during our trip to the San Fransisco Zoo. Lots of us use Emma's stamps on our cards but because they are so versatile, you can really use them on anything! I used several of her sets on this layout. Please read below for the full recipe. For the background, I used Emma's Build a Banner Kit using the burlap stamp. I used the XL label die and the coordinating label XL label boarders stamps for my title. The letters are from the Any Day Bingo and Crossword set. I used Emma's Cherish the Moment set to stamp "Good Times". I love this set because you can really use it on any crafty project! Thank you Emma for choosing me! Please make sure you come back and see what else I create with these fantastic stamps! Big crafty hugs! Nancy, your layout is GORGEOUS (as is your family)! You have such an awesome way of pulling together so many different elements. I'm so excited to have you on the team! congrats to you for being picked!! so happy for you! I look forward to following you and seeing your projects!! this layout is too cute!! What a wonderful LO and wonderful family. Congrats. Great layout, Nancy! I love your use of embellishments! Welcome to the team! congrats nancy! your layout is just BEAUTIFUL! I have to agree with everyone, your layout is GORGEOUS.. congrats on being on Miss Emma's DT.. I know you will be having sooo much fun.. Such a beautiful layout Nancy!! And a big congrats to you for making the DT!! Congrats on making the team! I look forward to getting to know you and working with you. Your layout is beautiful! Love your sweet layout! Congrats on your team assignment! I look forward to working with you!!! Congratulations on being on the Design Team...I know you will have a great time. Your project is beautiful and a great memory. WOW!! Your layout is GORGEOUS!!! You are definitely going to bring something different & unique to "My Creative Time" products! Thank you for being a part of this AMAZING team~! i am looking forward to working w/you you!